I bought this because of Nightcrawler, and because of the cover. Well, the regular cover, anyway–the wraparound/double-page-spread-sized image (see below). I usually hate the “return” of dead characters, but given recent indoctrination to the “well, how LONG are they gonna STAY dead?” thing I’ve simply been waiting for this; knowing it WOULD come about, just not sure which year it’d be (turns out, 2013 into 2014). And darn, that’s a nice cover! My expectation for this issue was pretty low going in, despite recognizing the potential, and “knowing” this is the “return of Nightcrawler,” from snippets I’ve spotted online–that I’ve come across without specifically seeking out. I figured hey, I’ll give this issue a shot. ONE issue, a first issue of a new series…a few pages to “convince” me to come back for another issue, without leaving me further disillusioned with Marvel Stuff. The issue opens with an extremely basic summation of Nightcrawler, then picks up with Nightcrawler himself, and the beginnings of this grand adventure. Some demons launch a raid on the edge of this afterlife realm, and Nightcrawler fights back. Turns out his father–Azazel–is leading the campaign. Of course, Nightcrawler opposes him, a yet-unfinished task before he can “move on.” Back on Earth, Angelica Jones (Firestar) arrives at the Jean Grey school as a new member of the staff…but finds things are not nearly as simple as she’d expected. Amidst other goings-on, the staff–led by Beast–find that the Bamfs infestation is much more significant than they’d thought, and leads them to realizing something rather big is touching off. Now, my first thought, slightly tangential: if there are plus Bamfs for sale anywhere, I totally want a blue one! I don’t know when these things showed up, but I think I was only just aware enough of their existence that I’m not scratching my head here…maybe I’m drawing on some metatextual knowledge as well that made ’em amusing…and Really Darned Cute! Visually, I highly enjoyed this, from the cover on through. As said above, the cover “sold” me on this issue, and the art fit the cover and the story, and I was never once taken out of the story by some weird panel or not being able to follow what’s going on. (And darn if those Bamfs aren’t cute lil’ critters!) I don’t care for Storm’s look, but that’s the mohawk and such, not the art itself. Despite Beast’s relatively new look, I had to remind myself that it WAS his new look…he just looked like Beast. 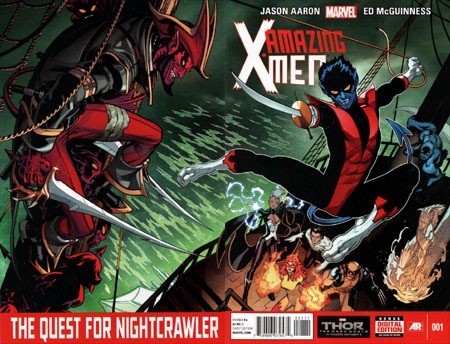 And I couldn’t help but grin at Nightcrawler getting the swords and swinging into action…the cover isn’t itself an exact scene from the issue, but it conveys some of the spirit of what went on. Story-wise…The characters themselves are not (yet) reunited with Nightcrawler, sure. But we (the readers) get the first few pages of this issue to spend with him, before being “stuck” with the non-Nightcrawler characters of the title. We get Firestar brought into things, some context of her past with the characters (including Iceman), and stuff like that; context that Bamfs have been around the Jean Grey School for awhile and not a major problem til now. And by issue’s end we can see what’s coming, and left off with a cliffhanger that I don’t HAVE to see the resolution to…it’s a cliffhanger I WANT to see the resolution to. 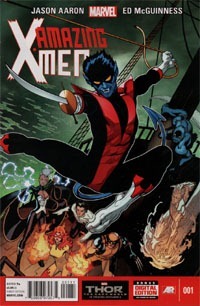 The issue begins the return of Nightcrawler. We get Nightcrawler IN THIS issue–no waiting for #2 or #3 to so much as see the character. We get a great cover that fits the issue. We get immediate gratification while being primed for more to come. It’s a great balance. We get exposure to other characters that will feature in this title, despite also being featured in other titles…we get setup for coming issues. I had planned to skip this issue. I’m tired of $3.99, I’m tired of double-shipping books (no clue offhand if this is going to be a double-shipper or just an old-style once-a-month title), but couldn’t resist checking this out. And for this first arc at least, I’m on-board. The story’s good and gives plenty I like in my first-issues; the art’s very much to my liking (and I don’t remember specifically liking McGuinness‘ work this much previously), so all in all I’m quite satisfied with the issue and definitely looking forward to the next issue. All in all, you don’t really need to be up on a lotta current continuity, I don’t think. Knowing all the recent goings-on throughout the X-books will surely lend a richer experience and contextual knowledge. 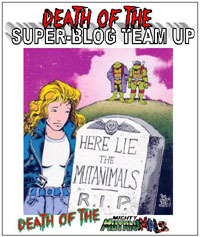 But the core stuff is given in this issue and/or looks likely to be able to be picked up further as the arc continues. Especially if you’re a fan of Nightcrawler, whatever you thought of his demise in Second Coming, this is very much an issue to get. And even taken alone, this is a solid first issue if you want to jump into an X-book fresh with a #1 issue. Highly recommended! I found this volume at a Half-Price Books last weekend, and wound up buying it. Not the best deal I’ve ever found–especially for something as skinny as this volume–but not the worst. As single issues, this story came out I believe December 2011 to March 2012, essentially leading into AvX. 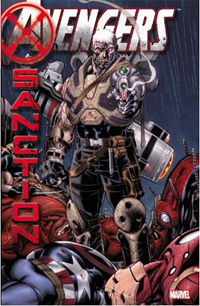 Last year, I was both put off yet intrigued at a new story focusing on Cable. Though the character had supposedly died at the end of 2010’s Second Coming, here he was, back after less than 2 years; barely a year and a half (in other measure: less than 3 6-issue arcs’ time). From what I recall, despite some mild interest in Cable’s return and dealing with the Avengers…it was this being a mini-series priced at $3.99 that really put me off. And then learning it wasn’t even to be a self-contained story, but lead into a major 2012 event. So I passed on it as singles. Though this only contains 4 issues, it’s priced at $24.99–essentially $6.25 per issue of content (makes $3.99 per issue seem like a steal). Granted, this is an oversized hardcover, and a 4-issue premiere hardcover might be $19.99 (basically $5 per issue of content), so the oversized format could “justify” a higher price. But this sort of pricing is absolutely NOT worthwhile for only four issues, and this story in particular. I’m actually somewhat regretting paying half of that $24.99 for this as-is. The Ed McGuiness art is not bad–I liked his work on some of the Superman and then Superman/Batman stuff, and while I wouldn’t consider it exactly “ideal” for this story, it works. The story itself seems overly simple and “decompressed” to a large degree and really comes out of nowhere. Cable draws Falcon off from a fight and incapacitates him, knowing Captain America would follow. The two fight, and Cap is incapacitated. Next, Iron Man shows up and he, too, is incapacitated. Then Red Hulk shows up, followed by Cyclops, Wolverine, and Hope herself. We learn amidst all this that Cable apparently did not actually die, but reunited with Blaquesmith, and learns that the destroyed world they’re in could be prevented if Hope had lived–having apparently died due to the Avengers. So with just hours to live until the techno-organic ravaging his body kills him, Cable travels to the past to take out the Avengers so that Hope can live and save the world. While it’s long since become a moot point…I continue to find myself curious about Cable’s techno-organic virus; recalling that in #100 of his series back in the early 2000s, the character made a concerted effort and managed to excise the virus, removing it as a factor in his life. Seeing it back here and playing such a pivotal role seems rather contradictory. I’m also not convinced that this needed to be its own separate series…if it was really so important, it might have been worth an issue or two of an Avengers title or even one of the X-books. At the least, it could probably have been “compressed” to fit a double-sized one-shot rather than be stretched into 4 issues. Ultimately, this is a fairly mediocre series/story/volume, and way too quick a read for $25. If you can find it for half (preferably more)-off, the art at least is worth looking at, and while I don’t recall what material is contained in the It’s Coming tpb preceding AvX, this seems like it would have been much better served being billed as a specific prequel to AvXrather than some stand-alone thing.